What creature has a very short life span in the warm months yet can live several times longer in the challenging cold of winter? That is precisely the reality for the worker bee. 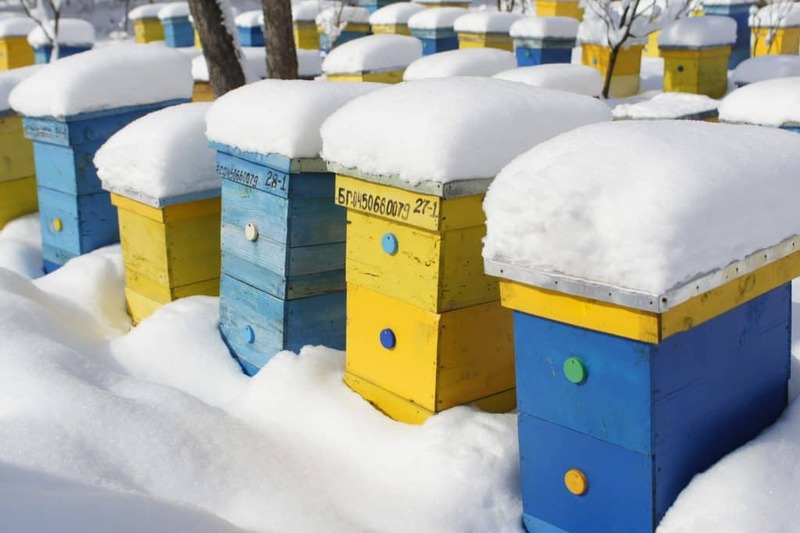 The survival of bees during the winter is a story of epic preparation and a huge collaborative effort within the hive, from late fall to the onset of winter. Worker bees that live in the warmer months have a hard and necessarily disciplined life ahead of them. From the moment they emerge from their cell to the last flap of their wings, they are aptly considered workaholics. Their industry puts great stress on their tiny bodies and they use a huge amount energy in working so diligently. The end result is a lifespan of around 6 weeks. By comparison, the worker bee that lives through the winter months has a much more focused, singular role. Her sole objective is to help see the queen through to the spring, at which time the queen can start laying eggs again. The winter worker bee is a bridge from one generation of the queen’s offspring to another. Her reward for seeing the queen through this challenging period is the potential to live from early winter to spring. We are used to seeing our bees venture away from the hive during the warmer months, but that is not an option during the winter. The temperatures are too low and other risks such as bad weather and starving pests simply make this impossible. And so, bees prepare at great length for the oncoming winter by building stores of honey within the hive. This store represents their lifeline for living until the spring and they are entirely dependent on having enough honey to see them through that period. A beekeeper is advised not to take honey from a first-year beehive, giving the bees the best chance of surviving winter. The amount of honey required to survive the winter depends on the depth and duration of the winter. In warmer climates, 30 lbs. or so may be adequate but the harsh, colder winters in the north may require as much as 100 lbs. That’s a very considerable burden on the first-year colony. There are a number of ways in which bees prepare for the winter. Their store of honey is a heavily protected resource and anything that limits how long it will last is considered a risk. Drones are one such factor. While they are clearly essential to the reproduction of the species, drones contribute very little to the actual running of the hive. Indeed, when it comes to the consumption of honey they are a negative drain on essential resources. Worker bees see this coming and as the winter approaches, they evict drones from the hive. The idea of carrying “passengers” who simply consume honey through the winter is simply not a viable trade-off. So out the drones go. It’s a ruthless but essential process, including the physical eviction of drones by worker bees. Along the same lines, increasing the number of bees in the colony as winter approaches makes little sense. Brood at this time also translates into more mouths to feed. This isn’t purely a factor of reducing the number of bees consuming the honey reserve, but also reflects the simple truth that in fall there is less nectar and pollen anyway. The net result is that brood rearing falls considerably, an intentional act on the part of the colony as it prepares for winter. Getting through the winter is a very different challenge than life in the summer. Bees are extremely well adapted to their environment at the best of times and they change their body make up to prepare for the worst of times. Specifically, the approach of winter creates so-called fat bees. Fat bees are winter bees – bees much better suited to get through the winter, as follows. A compound called vitellogenin helps bees store food reserves in their body. This is less necessary in the summer, when they can freely move to and consume food. But in the winter vitellogenin becomes more important, so a fat bee has more. The end result is indeed a fatter bee, but also one better able to tolerate and survive the cold weather of winter. With the preparation done and the cold months arriving, it’s time for the colony to “bed in” for the winter. As with most things bee-related, what happens in the apparently still and quiet hive is rather remarkable. What is the winter cluster? This when bees gather very close together to keep a single queen at a comfortable, life-sustaining temperature. The objective of the winter cluster is simple, namely to reach the spring with a healthy queen and enough workers to restart the foraging and expand the colony all over again. The principle resources they need are warmth and nutrition. Bees are cold-blooded. However, somewhat unusually, they do not simply die off and leave nested eggs to continue the species through the winter. Neither do they hibernate. Instead they remain active all winter, eating and metabolizing honey throughout. The queen is kept at a steady temperature by being “hugged” by workers throughout the winter. The worker bees will form a cluster – hence the name – around her, enclosing her in a small but warm space. They “shiver” their flight muscles, which creates heat. With thousands of worker bees this can create a considerable heat source. There are some fascinating aspects to the winter cluster. If the outside temperature climbs above 50 F, bees will often take advantage to leave the hive and defecate, thus helping the cleanliness of the hive. These are called cleansing flights. Staying warm is important but for continued warmth the bees need a source of energy throughout the winter. That is the purpose of the honey reserve they build. The whole cluster will gradually move around the hive, as one, passing over and consuming honey they have previously stored, fueling their muscle-originated warmth. If temperatures are within certain boundaries, the cluster can move around and “jump” from one part of the honey-laden hive to another. It is not uncommon, though, for the cluster to be stranded – not able to reach perfectly good honey they have stored because temperatures are too cold, even though they have exhausted resources in the area in which the cluster resides. The loss of a colony due to cold, with a store of honey just out of reach, is a sad demise for the colony. 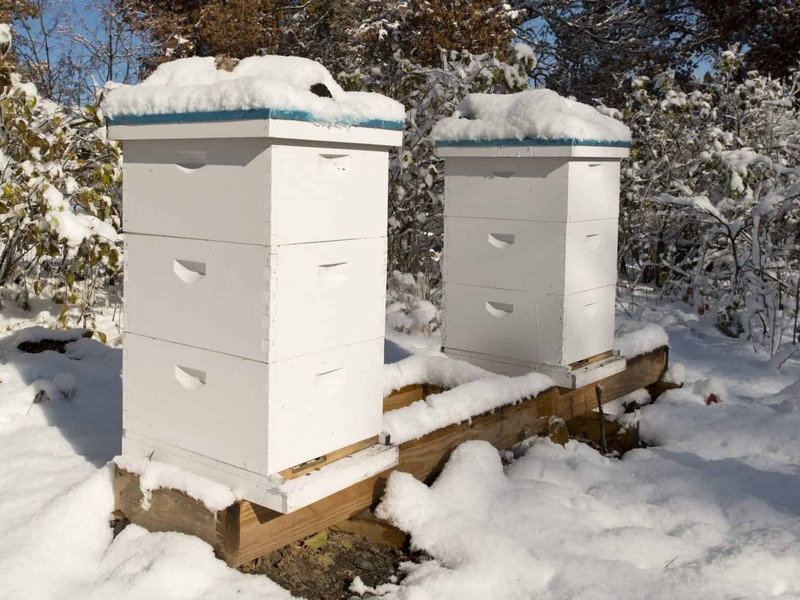 The winter cluster is a remarkable process though which bees find a way to survive frigid weather, thanks to an extraordinary effort and planning in the warmer months. I was reading your great article but wanted to mention that bees don’t prepare a great length for winter because they don’t know winter is approaching….as for honeybees, it’s their natural way to store honey anytime whenever nectar is available, spring or fall.